The survey also finds that acceptance of homosexuality is particularly widespread in countries where religion is less central in people’s lives. These are also among the richest countries in the world. In contrast, in poorer countries with high levels of religiosity, few believe homosexuality should be accepted by society. Age is also a factor in several countries, with younger respondents offering far more tolerant views than older ones. And while gender differences are not prevalent, in those countries where they are, women are consistently more accepting of homosexuality than men. Publics in Africa and in predominantly Muslim countries remain among the least accepting of homosexuality. In sub-Saharan Africa, at least nine-in-ten in Nigeria (98%), Senegal (96%), Ghana (96%), Uganda (96%) and Kenya (90%) believe homosexuality should not be accepted by society. Even in South Africa where, unlike in many other African countries, homosexual acts are legal and discrimination based on sexual orientation is unconstitutional, 61% say homosexuality should not be accepted by society, while just 32% say it should be accepted. Overwhelming majorities in the predominantly Muslim countries surveyed also say homosexuality should be rejected, including 97% in Jordan, 95% in Egypt, 94% in Tunisia, 93% in the Palestinian territories, 93% in Indonesia, 87% in Pakistan, 86% in Malaysia, 80% in Lebanon and 78% in Turkey. Elsewhere, majorities in South Korea (59%) and China (57%) also say homosexuality should not be accepted by society; 39% and 21%, respectively, say it should be accepted. South Korean views, while still negative, have shifted considerably since 2007, when 77% said homosexuality should be rejected and 18% said it should be accepted by society. 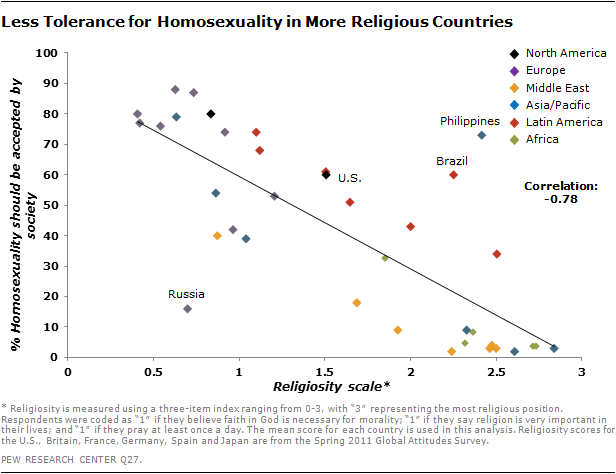 There is a strong relationship between a country’s religiosity and opinions about homosexuality.2 There is far less acceptance of homosexuality in countries where religion is central to people’s lives – measured by whether they consider religion to be very important, whether they believe it is necessary to believe in God in order to be moral, and whether they pray at least once a day. There are some notable exceptions, however. For example, Russia receives low scores on the religiosity scale, which would suggest higher levels of tolerance for homosexuality. Yet, just 16% of Russians say homosexuality should be accepted by society. Conversely, Brazilians and Filipinos are considerably more tolerant of homosexuality than their countries’ relatively high levels of religiosity would suggest. In Israel, where views of homosexuality are mixed, secular Jews are more than twice as likely as those who describe themselves as traditional, religious or ultra-Orthodox to say homosexuality should be accepted (61% vs. 26%); just 2% of Israeli Muslims share this view. In most of the countries surveyed, views of homosexuality do not differ significantly between men and women. But in the countries where there is a gender gap, women are considerably more likely than men to say homosexuality should be accepted by society. 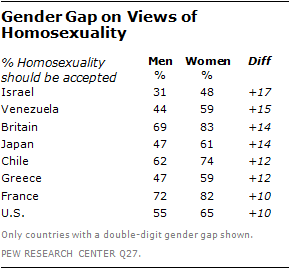 In Japan, Venezuela and Greece, where about six-in-ten women say homosexuality should be accepted (61% in Japan and 59% in Venezuela and Greece), fewer than half of men share this view (47%, 44% and 47%, respectively). About half of women in Israel (48%) express positive views of homosexuality, compared with just 31% of men. And, while majorities of women and men in Britain, Chile, France and the U.S. say homosexuality should be accepted by society, women are more likely than men to offer this view by at least ten percentage points. In many countries, views of homosexuality also vary across age groups, with younger respondents consistently more likely than older ones to say homosexuality should be accepted by society. Age differences are particularly evident in South Korea, Japan, and Brazil, where those younger than 30 are more accepting than those ages 30-49 who, in turn, are more accepting than those ages 50 and older. For example, in Japan, 83% of those younger than 30 say homosexuality should be accepted, compared with 71% of 30-49 year-olds and just 39% of those 50 and older. Similarly, 71% of South Koreans in the younger age group offer positive views of homosexuality, but just about half of 30-49 year-olds (48%) and 16% of those 50 or older do. In Brazil, about three-quarters of those younger than 30 (74%) say homosexuality should be accepted, compared with 60% of those in the middle category and 46% of those 50 or older. In the EU, solid majorities across age groups in Britain, France, Germany, Spain, Italy and the Czech Republic express positive views of homosexuality, although Italians and Czechs ages 50 and older are considerably less likely than younger people in these countries to say homosexuality should be accepted. At least eight-in-ten Italians younger than 30 (86%) and ages 30-49 (80%) share this view, compared with 67% of those ages 50 and older. In the Czech Republic, 84% of those ages 18-29 and 87% of those 30-49 say homosexuality should be accepted, while 72% of those ages 50 and older agree. In Greece, where acceptance of homosexuality is not as prevalent as in most of the EU countries surveyed, majorities of 18-29 year-olds (66%) and 30-49 year-olds (62%) say homosexuality should be accepted by society; far fewer Greeks ages 50 and older (40%) share this view. People ages 50 and older in the U.S., Canada, Argentina, Bolivia and Chile are also less likely than those in the two younger age groups to say homosexuality should be accepted by society, although at least half of those 50 and older in all but Bolivia are accepting, including 75% in Canada. In the U.S., 70% of those ages 18-29 and 64% of those ages 30-49 are accepting of homosexuality, compared with about half of Americans ages 50 and older (52%). In Bolivia, however, 53% of 18-29 year-olds and 43% of 30-49 year-olds say homosexuality should be accepted, but just 27% of those in the older group share this view. Mexicans and Chinese ages 18-29 are more likely than those in each of the other two age groups to offer positive views of homosexuality, but there is no significant difference between the views of 30-49 year-olds and those 50 or older. And in Russia, El Salvador and Venezuela, those younger than 30 are more tolerant of homosexuality than are those ages 50 and older, while the views of those ages 30-49 do not vary considerably from those in the youngest and oldest groups. Across the predominantly Muslim countries surveyed, as well as in the six sub-Saharan countries, solid majorities across age groups share the view that homosexuality should be rejected by society. In Lebanon, however, there is somewhat more acceptance among younger respondents; 27% of Lebanese younger than 30 say homosexuality should be accepted, compared with 17% of 30-49 year-olds and 10% of those 50 or older.